As a former devout christian (intentional lower-case c), I felt compelled to include in my first novel, an important setting from my childhood, the Mormon Visitor center in Salt Lake City, Utah. At various times of the year, my parents would take their twelve children, I’m #2, to visit the famous LDS tourist attraction. In what the Mormon’s call Temple Square, there are several buildings, including the Tabernacle, the SLC Temple and the North Visitor center where the iconic statue of the Christ is set against an ornate celestial background. During my childhood, the most impressionable visits were to see the Nativity scene during the annual idolization of commercialism, AKA Christmas. The Nativity scene on Temple Square is a life-size display, in an open field, of baby Jesus in the manger with all the typical animals and visitors. As a tradition, many Mormons visit the site near Winter Solstice time, to see the Nativity scene and the amazing display of Christmas lights. As a child, a magical feeling accompanied the event, almost like I was visiting an ancient religious site guarded by holy supernatural entities. These are still pleasant memories, even now after discovering the ugly history behind mormonism and christianity! For more information about my personal, traumatic experience with religion, see the links at the end of the article. In order to avoid giving away any spoilers in the Silent Subversion story, I will refrain from giving too many details. Since a key element of the story involves Salt Lake City, I decided to include a scene in the place that always gave me such a sense of wonder for the universe. 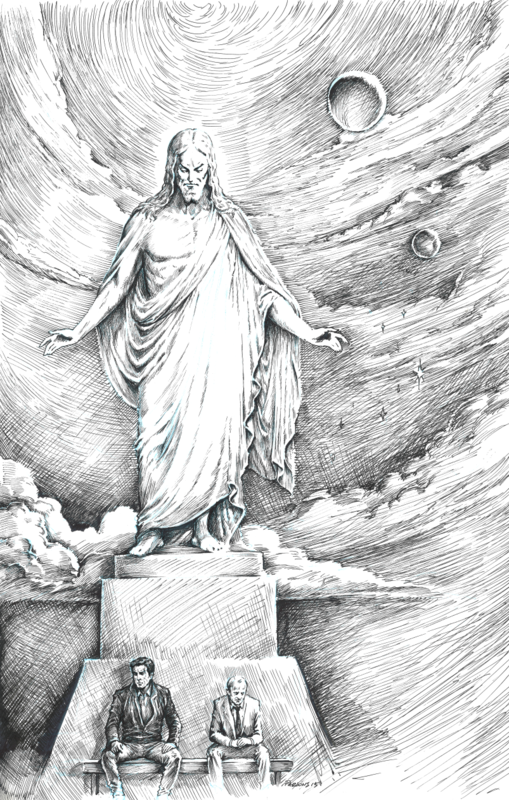 As seen in the illustration below, there are depictions of celestial objects surrounding Jesus, giving the impression that Jesus is as real as the objects in the cosmos. Leaders of the world religions have learned to use the same tactics as their governments and institutions. In order to make something appear real, something that may or may not be real, all that needs to be done is to invest a large sum of money to build the illusion. Of course, no one thinks the statue and its beautiful surroundings proves Jesus’ existence, but it all helps create the psychological impression which in turn helps perpetuate the myth. This has been done throughout history as seen in the ancient temples, filled with the gods of the time. Human tactics and emotional responses remain the same throughout history. Perhaps in a small way, the statue of Jesus helped embed the reality of the god in my young mind. I wanted to include an example of this mind-control technique for historical perspective and especially since I had a personal experience with it. In the illustration, below, Gerald meets with the key suspect in his investigation, a man with a popular Mormon name, excluded to minimize spoilage. I wrote this part of the story from Gerald’s viewpoint for a couple of reasons. Primarily, I wanted to show the Mormon stronghold from an outsider’s perspective, from a man who went through his youth without religious influence. I also wanted to show a non-religious character’s attempt to understand what motivated someone who believes in the actual influence of angels in his life. For example, Gerald assumed that this man wanted to meet him at the Mormon Visitor’s center in the hope that the location might offer some sort of protection from the dangerous information he possessed. Kiel, the illustrator, wanted to exaggerate the statue’s immensity compared to the insignificant humans. Even though the final depiction is slightly different than in the book, from the character’s positions, I love Kiel’s interpretation of the scene! The title of this section does not refer to a historical evolution of the Jesus myth, but how the image changed in the illustration and why. There are many excellent references to how Jesus has evolved throughout history which I will not reference here. 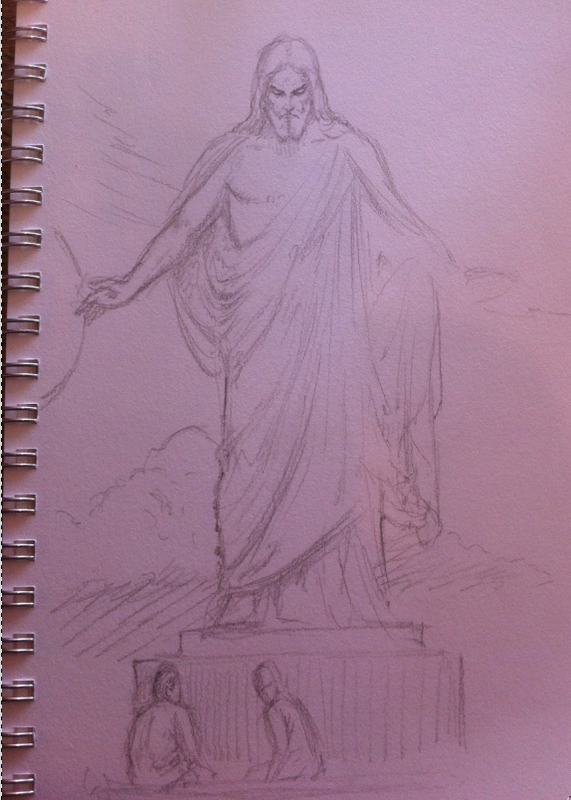 In the illustration, Kiel referred to the statue as the Rapier Jesus. 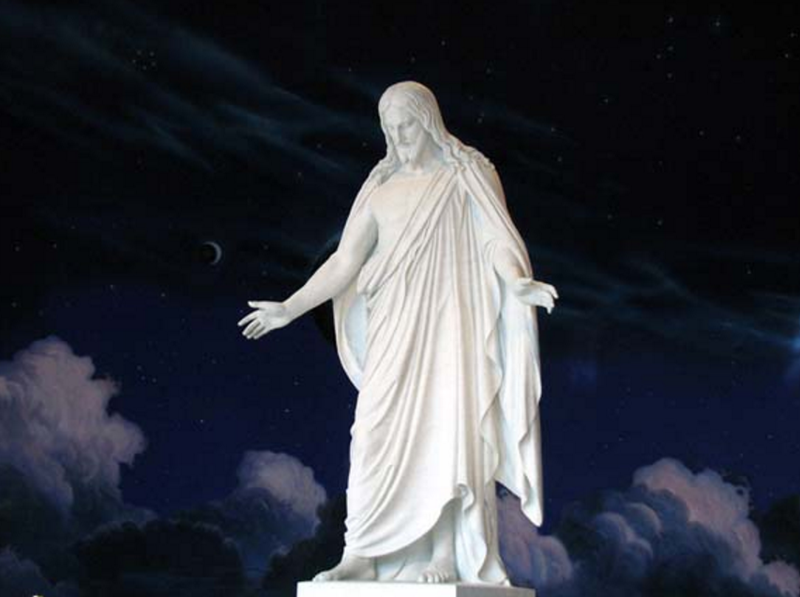 I always wanted the illustration of the Jesus statue, in the beautiful Mormon Jesus display center, to have a contrasting sinister quality. That is not how I view the mythological being we call Jesus, but that is how I view its effects on the human psyche. The actual statue in the visitor center is a typical, peaceful representation of how religions want the public to view their god. Times change, but the tactics of those in control of all the wealth, do not change. They filled the ancient world with gods and mythological beings, creating a mysterious illusion to replace reality. In the illustration, I don’t think Jesus looks sinister enough, but I think that a more hideous version of Jesus would distract from the overall impression. My personal blog entry, when I made the public Announcement of leaving religion.